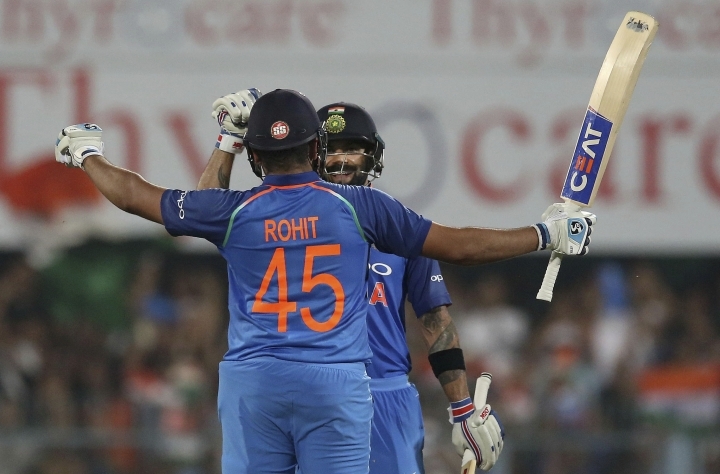 GUWAHATI, India — Virat Kohli and Rohit Sharma hit attacking hundreds as India beat West Indies by eight wickets to take a 1-0 lead in the five-match ODI series on Sunday. 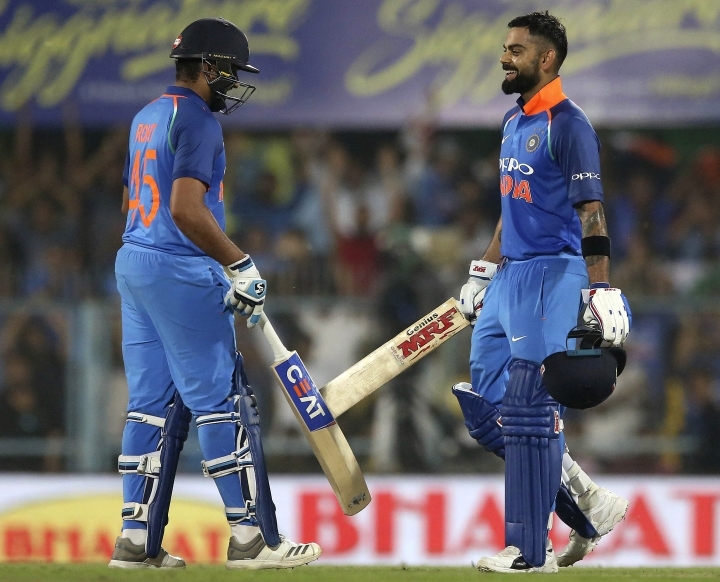 Man-of-the-match Kohli scored 140 off 107 balls while Sharma was unbeaten on 152 from 117 balls as India chased down the 323-run target with ease. 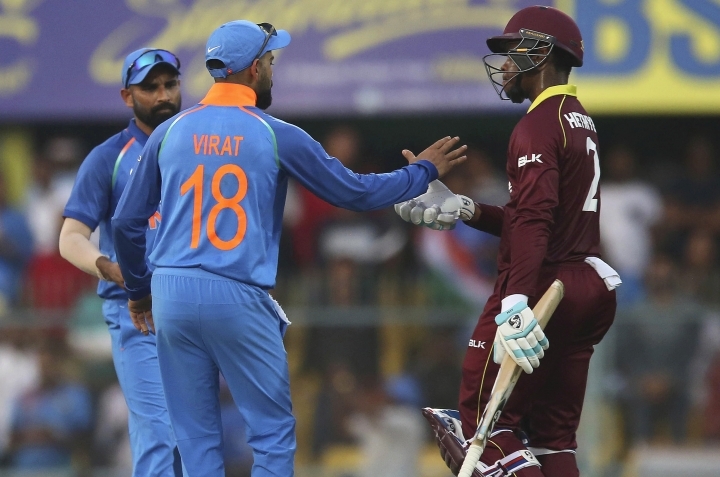 Put into bat by India, West Indies scored 322-8 with 106 from Shimron Hetmyer. India ended on 326-2 off 42.1 overs. Host India didn't get off to the best start when debutant pacer Oshane Thomas (1-83) bowled Shikhar Dhawan (4). But Kohli and Sharma came together and stayed until the 33rd over, putting on 246 runs for the second wicket in a masterly batting display. "It was one of those days where I felt good and I told Rohit that I will continue to bat positively, and maybe he could play the anchor," Kohli said. "When I got out, (Ambati) Rayudu played anchor and Rohit took over from me. That's what ODI batting is all about." Kohli raced to his half-century off only 35 balls. At the other end, Sharma played the waiting game as India chased a potentially daunting target. The 100 came up in only 15.1 overs, and Kohli reached his 36th ODI hundred off only 88 balls. Overall, the Indian skipper hit 21 fours and two sixes. Sharma reached his half-century off 51 balls. The second 50 runs off his innings came off only 33 balls as he scored his 20th ODI hundred in 88 deliveries. Overall, Sharma hit 15 fours and eight sixes. His third 50 runs came off only 29 balls. It was a relentless attack on the bowlers as India raced past 200 in the 29th over and West Indies' hopes dissipated quickly. Kohli was eventually stumped off Devendra Bishoo in the 33rd over but the damage was already done. Sharma finished the job with 47 balls to spare. Earlier, opener Kieran Powell scored 51 off 39 balls, while Jason Holder (38) chipped in with valuable runs later in the innings as West Indies set an imposing target despite losing regular wickets in the middle overs. 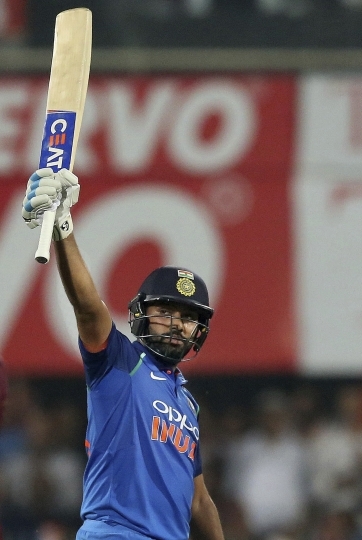 Powell's hard hitting against Indian pacers brought in the runs, and Mohammed Shami, returning to ODI cricket after a year away, proved expensive at 2-81. Despite the early dismissal of debutant Chandrapaul Hemraj (9), Powell and Shai Hope (32) continued scoring at nearly six runs an over and put on 50 runs off 41 balls. West Indies was dominating the run of play, when Powell top edged Khaleel Ahmed and was caught behind. 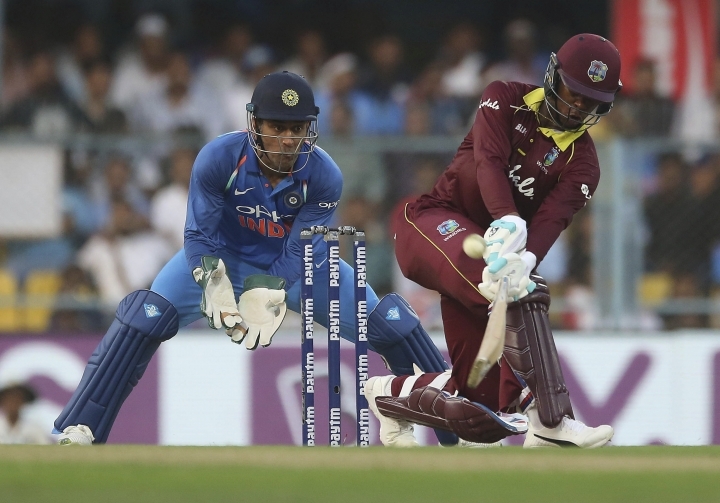 Leg spinner Yuzvendra Chahal (3-41) trapped Marlon Samuels lbw for a two-ball duck, and Hope was caught behind off Shami with West Indies suddenly struggling at 114-4 in the 22nd over. Hetmyer took charge of the innings and made good use of perfect batting conditions as he smacked six fours and six sixes. He reached his half-century off 41 balls and put on 74 runs with Rovman Powell (22) for the fifth wicket. Holder and Hetmyer put on 60 for the sixth wicket. 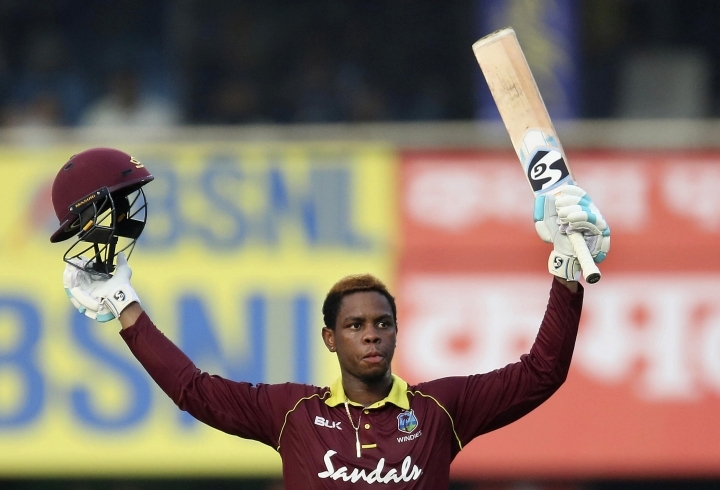 Hetmyer reached his third ODI hundred in style with a six off just 74 balls. He was out soon after trying to clear the square leg fence off Jadeja. Bishoo (22 not out) and Kemar Roach (26 not out) put on 44 off 40 balls for the ninth wicket as Indian pacers went for 68 runs in the last 10 overs. 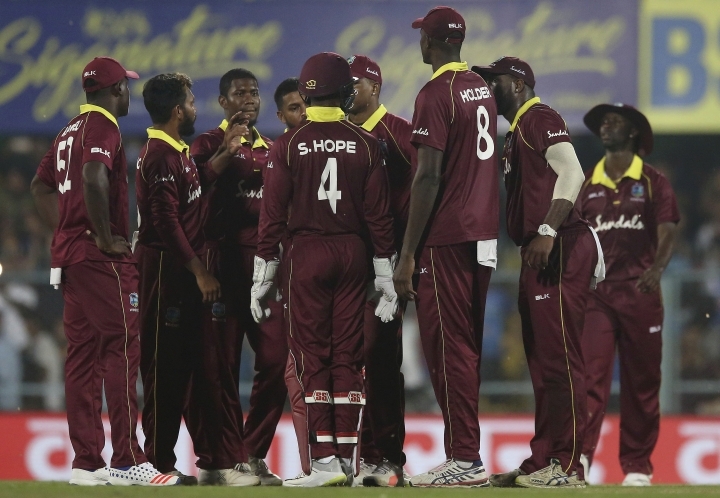 "We are pleased with our batting effort but we need to be a lot more decent with the ball," skipper Jason Holder said. The second ODI is at Visakhapatnam on Wednesday.